Anthony Stefano’s shootout goal proved to be the winner in a thrilling 5-4 Barrie victory in Niagara. This was the first meeting of the season after the Icedogs put away the Colts in 4 games in last years Eastern Conference finals. With both teams missing some key parts from the battle a year ago, it was new leaders stepping up. Colts rookie defenseman Chris Cameron moments into the game threw a puck on net, which found it’s way through a screen but didn’t beat the post to keep things scoreless. Colts were dominating play early on in the game in terms of puck possession, shots and in the face-off circle but things remained scoreless until just under 5 minutes into the period. Roy Radke scooped up a loose puck in the neutral zone and used his big body to get around the defenseman and went upstairs to beat Stephen Dillon for his 5th goal of the season. Shortly after it was the Icedogs that took the momentum and were peppering shots on Christian Propp who was making just his 3rd start of the season. The Colts rookie net minder remained strong to keep them off the board. Barrie finally woke up again, as Radke snapped home another one to give the boys in blue a 2-0 lead off a great centering pass from Adrian Carbonara. After taking a penalty earlier in the period, Barrie’s Defenseman Kade Landy took a minor, which Niagara was able to capitalize on this time. Chris Paquette hammered home a point shot for his 8th goal of the season on a one-timer. Both Ryan Mantha and Graham Knott picked up assist on the powerplay marker. The dogs kept the pressure on, as just seconds after scoring they were all over Propp again but the Milton, ON native was sharp making 47 saves in the victory, keeping the lead for Barrie. The 2nd period picked up the way the 1st ended, with both teams creating chances. Both goaltenders were forced to make big stops to keep the score at 2-1. 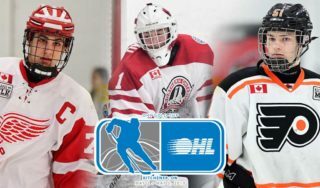 Later in the period it was Barrie’s top line connecting with some sweet passes as Anthony Stefano played one behind the net for Lucas Chiodo who found the Colts captain Cordell James streaking in front, but was stopped cold by the glove hand of Stephen Dhillon. Just as it looked like the 2nd period was going to end with no scoring, the Icedogs struck. With just under 4 minutes remaining in the frame, Oliver Castleman potted his 4th goal of the season off of a redirected shot from the point bounced onto his stick and he made no mistake. Austin Clapham drew the lone assist on the tying goal. In the dying seconds of the period on a Niagara powerplay, the Dogs gave themselves their first lead of the hockey game. Niagara captain Mantha absolutely blasted one upstairs on Propp. The 2nd period wrapped up with the Dogs in the lead 3-2 and outshooting the Colts by a whopping total of 31-14, holding Barrie to just three shots in the period. Dale Hawerchuk’s club didn’t waste any time to get things back square in the 3rd. Just 31 seconds into the period Lucas Chiodo drove to the net and was stopped by Dhillon, but the puck bounced back to his stick and he stayed with it to bury his 4th goal of the season. Matt Brassard and James both picked up assists on the tying goal. Minutes later Barrie continued to dominate the 3rd as Brassard carried the puck around the Niagara zone finding Radke in front of the net, but was rejected of a hat-trick after he rang one off the iron. Barrie would get their lead back and Radke was a huge part of it. After dancing into the zone with the puck the Chicago 6th rounder left a drop pass for Adrian Carbonara and then took a huge hit, although it was worth it as Carbonara finished it off to give Barrie the 4-3 lead. The lead was short lived, Knott stole the puck from Justin Murray in the Colts’ zone and wasted no time in sliding it past Propp to tie the game back up just 38 seconds later for his 4th goal of the season. The extra frame did not lack excitement. The Icedogs were relentless on the powerplay throwing everything at Propp looking for the win. 3 blocked shots in one sequence by Cam Lizotte highlighted the overtime period. The Colts improve their shootout record to 2-0 with the 5-4 win. The Colts are back at it tomorrow night back at the BMC vs. another Central Division opponent the Sudbury Wolves, looking to make it a winning weekend. 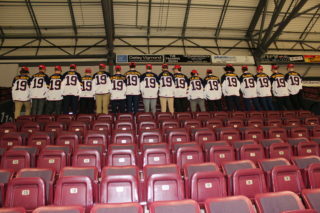 Stay up to date with your Barrie Colts by downloading the Official Barrie Colts App today. It’s absolutely free.